(Nanowerk News) “The textbook said we should see slow, gradual and random. But what we saw? BOOM! Fast, explosive and organized!” said Michael Tringides, physicist at the U.S. Department of Energy’s Ames Laboratory and a professor of physics and astronomy at Iowa State University ("Nonclassical “Explosive” Nucleation in Pb/Si(111) at Low Temperatures"). Tringides is talking about the unusual atom movement he saw when they dropped a few thousand lead atoms onto a flat, smooth lead-on-silicon surface, all at low temperatures, and looked at an area just one-twentieth the width of a human hair. 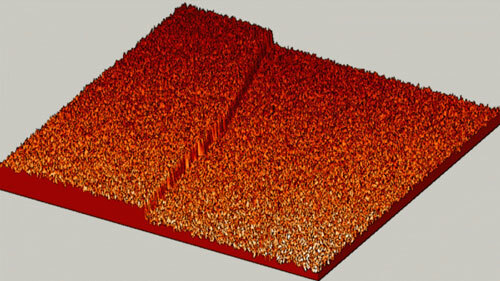 Ames Laboratory scientists observed lead atoms unexpectedly moving collectively on a lead-on-silicon surface to "explosively" form metal nanostructures, all at low temperatures. The area shown here is about one-twentieth of the width of a human hair. What the Ames Laboratory scientists expected to see was “random-walk diffusion”: atoms milling around, looking like they have no idea where they’re going, where they’ve been, or that any fellow atoms are near them. Typically, the atoms eventually happen to run into each other and create small structures. The collective, fast diffusion observed by Tringides’ team could represent a new way to grow perfect, tiny metal nanostructures. Tringides’ research team specializes in measuring how atoms move on surfaces, revealing through scanning tunneling microscopy how the smallest structures begin to form. Over the past several years, they’ve used their expertise to answer fundamental questions about materials, such as rare-earths, graphene and metallic films, that are important to green energy technologies.